There's not much I enjoy more than an afternoon in the sewing room with daughter dear. What used to be two sewists, each at their machines speeding though their projects has turned into one sewist sewing and another making sure baby is happy, in between cutting, pressing, and generally supporting the sewist. All in all, it's a pretty sweet deal. In addition to moving forward on quilting projects, we managed to get organized with our Dots Swap! and have our swap fabrics ready to mail. That's a very good thing. Thanks to all who are joining us in our swap! 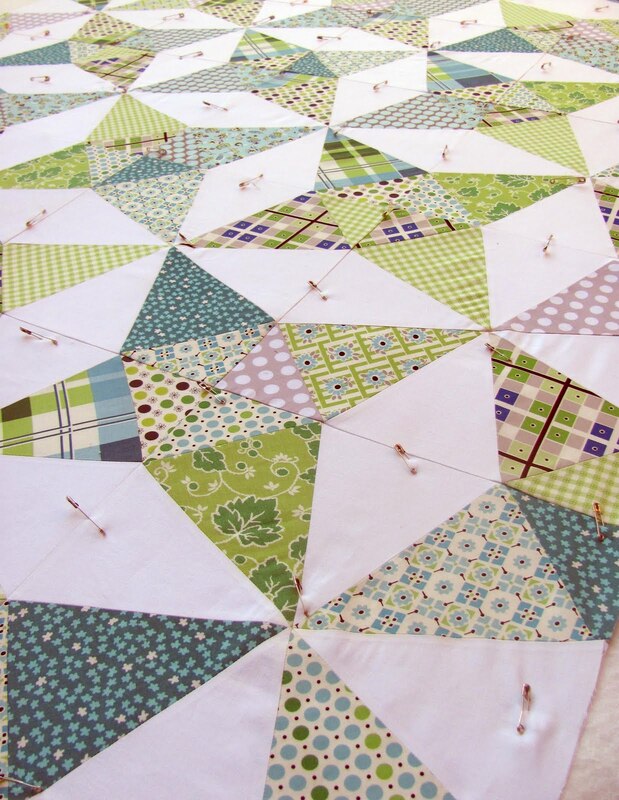 Later in the day, I managed to baste Kaleidoscope, after piecing the backing Saturday night. I must say, the process of putting this back together was a very positive experience, which isn't always the case for me. I credit the inspiration I found from Crazy Mom Quilts. You may remember the last time I basted a quilt, I did it out on our deck, which was really quite lovely. If you've been watching the weather news at all, you may have noted that while most of our country has been experiencing a heat wave, the Pacific Northwest has definitely not. According to those who calculate such things, prior to this weekend, we had had precisely 78 minutes of summer this year - defined as 80-degrees and above. Thankfully Saturday and Sunday (apparently, not today and beyond), we had summer weather. Which meant I had a perfect evening to baste another quilt on the deck! Not quite sure why, but it makes the task so much nicer! Unfortunately, I somehow managed to bleed on my quilt - in a white space, of course. When I realized it, I glanced at my hand and saw a teeny little prick where I must have met one of my basting pins. Fortunately for me (and you) I "bing"-ed 'blood stain on fabric' and came up with a solution I'd never heard of: 1/2 tsp. of laundry stain remover (I used Zout) in 1/2 cup of hydrogen peroxide. I am happy to report IT WORKED. And quick. Whew. I'm not usually one for laundry tips, but there you go. Lastly, I sat down to watch The Next Food Network Star last night, and was able to finish binding Dream Big! Yay for a finish to end the week. Like I said, it was a very good day! A very good day indeed! Thanks so much! i am loving the kaleidescope quilt! I really, really love the colours in your kaleidescope quilt, they are so soothing and calming! I have a gross trick for getting blood out...your own spit. I know, I said gross, but it really works, just work it in then wash it out!